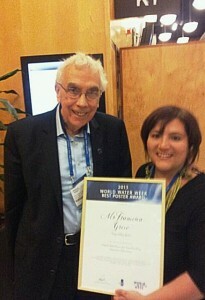 The recent months have seen the water research group make a big splash in the international fora. During the World Water Week in Stockholm, the biggest event in the annual calendar of the global water community, PhD student Francesca Greco scooped up the 2013 Best Poster Award for her work ‘Virtual Water Rivers and Transboundary Cooperation Interactions’. The jury highlighted the originality of her research and commented that it “add[s] value to our perceptions of virtual water and our options to negotiate transboundary cooperation”. You can read more about the award and jury’s comments on the conference page. In addition, the World Water Week saw Dr. Naho Mirumachi and Nate Matthews convening a session on ‘Achieving justice through transboundary water cooperation’. This session builds on the transboundary water politics research of the London Water Research Group. A synopsis of the session can be found here. Finally, Professor Tony Allan has received another prestigious award for his work on virtual water: the 2013 Fondation Prince Albert II de Monaco Water Award. The letter announcing his award valued his “contribution to the Science and [your] work for a better understanding of our environment”. There are more details and photo in the BBC coverage of this event. Welcome to the 2013-14 MSc Water students ! To the new, aspiring students on the MSc Water: Science and Governance programme, a big welcome to the Geography department and the vibrant water community here at KCL. The MSc Water degree is a one year taught programme that provides a unique opportunity to engage in both social and environmental science perspectives on water, drawing on the university’s leading reputation in water research. Taking advantage of the London location, students will have a chance to be part of leading academic and international water policy discussions through guest lectures, seminars and conferences, not to mention opportunities for professional networking. For prospective applicants for the next academic year, please take a look at the programme details and student testimonials, or contact the programme director, Dr. Naho Mirumachi. We are an interdisciplinary group that works on the biophysical, political, socio-economic, developmental and institutional aspects of water resources and their management. Our work is international, with ongoing projects in Tanzania, Brunei, the Mekong, the Andes and Amazon and the Middle East and elsewhere. Many of us run and contribute to the research activities and events of the London Water Research Group, a network of academics, professionals and activists engaged in water issues. Our research also informs our teaching to the MSc Aquatic Resources Management programme and MSc Water: Science and Governance programme offered at the department. In addition to the development of the concept of virtual (embedded) water, we have led the development of transboundary water politics analysis, water governance, aquatic resources and sophisticated spatial policy support systems for water resource and ecosystem service assessment. Here we post on our work, outputs, events and interactions with water issues around the world.